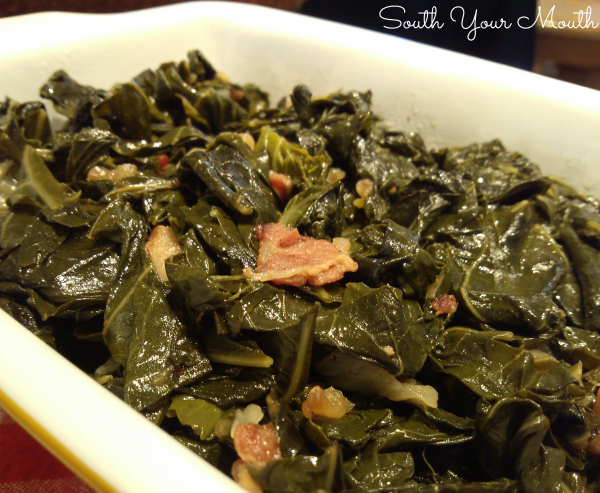 A step-by-step recipe for cooking authentic Southern collard greens. 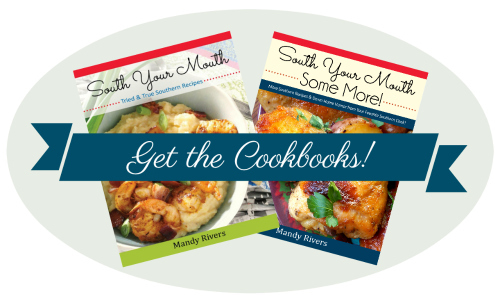 So, if you didn't know this already, we Southerners are pretty set in our ways when it comes to cooking certain dishes. Oh, we’ll eat it your way and be polite about it but we’re secretly talking smack about it under our breath. Don’t that heifer know you don’t use salad dressing in potato salad? Sweet baby Jesus, did she seriously put sugar in the macaroni and cheese? She used fat-free cream cheese in that icing. Bless her heart. And cooking greens is no exception. We all do it differently. I've seen more than one Southern food “expert” on television cook them in ways that made me grasp my chest and lean up against the door frame for a minute. I’m going to tell you how I cook them. This is how I was raised to cook them. And this is how I like them best! Crock Pot Pulled Pork – Perfectly seasoned, tender, juicy pulled pork cooked low and slow in a slow cooker. Butter-Braised Slow Cooker Pork Roast – A fork-tender pork loin drenched in sizzling butter seasoned with Cajun spices cooked to crispy perfection in the crock pot. Fall-Off-The-Bone Baby Back Ribs – Easy, oven-baked ribs cooked low and slow on a bed of onions. Coca-Cola Glazed Ham – Cola-cola glazed ham with brown sugar and dijon that self-bastes in an oven bag for a super easy, super special baked ham. Perfect Pork Tenderloin – A no-fail recipe for perfectly cooked marinated pork tenderloin with a simple glaze. Start by tearing each leaf off the stalk and placing the leaves in a clean sink full of cold water. Plunge the leaves several times into the water to clean them. Discard the stalk and any other debris. Drain the sink and rinse well. One-by-one, trim the center rib (midrib) from each leaf, cutting each leaf into two halves, discarding the rib. Add the leaves back to the sink and fill with cold water again to ensure they’re clean. Drain collards. A lot of folks skip this step but I think taking the time to trim that thick, fibrous rib out ensures your collards will be tender and not bitter. Place 6-8 leaves in a stack and roll tightly (like you’re rolling a cigar). Slice roll into 1-1/2 inch ribbons. Continue the process with remaining collards then set aside until ready to cook. Using the biggest skillet or widest pot you have (that has a lid), cook bacon and bacon grease over medium-high heat, uncovered, until bacon is almost crisp. Add onions and continue cooking until onions are translucent. Add as much of the collards as will fit in the skillet and toss to coat in the bacon drippings. Cover skillet with lid and let collards cook down (wilt) for 2-3 minutes. Add more collards and repeat this step until all collards are in the skillet. Reduce heat to low, salt to taste and continue cooking, covered, for about an hour or until collards are as tender as you like them; stir occasionally. If your collards don’t put off enough pot liquor (rendered liquid from the greens), add chicken stock or water, 1/4 cup at a time, to ensure there’s a little liquid (maybe a 1/4 inch) in the bottom of the skillet at all times. When I get collards, they’re usually given to me by someone who grew them in their own garden so I have to take extra care when cleaning them (it's not uncommon to find leaves, pine straw, dirt or maybe even a small critter in the bag). This is a basic recipe. Lots of folks like to add other seasonings such as red peppers, garlic, red pepper flakes, currants, sugar, vinegar, etc. Feel free to add anything that suits your fancy. I will sometimes add a pinch of sugar and a splash of vinegar but for the most part I like them plain and simple the best. Collards are often served with pepper vinegar on the side. Substitute vegetable oil for bacon grease if necessary then ask the Lord to forgive you for throwing out your bacon grease. I've always heard not to cook collards until after the first frost to ensure they’re not bitter. Love them but never cook them. LOVE my collard greens!! My first attempt in making them was a disaster....LOL! I also use salt pork instead of bacon. No need to add as much salt but some salt is still needed. And you are right, collards just aren't collards until after the 1st frost. But one way to help your collards, if you get them before the 1st frost, is to put them in the coldest part of your refrigerator for a couple of days so they can get really cold. It's not as good but it is better than nothing. We always have Mustard Greens on turkey day. I have been cooking for 50+ years and decided to try your collard recipe for our New Year's Day dinner. Will never go back to my old recipe after having these. Also cooked your blackeyed peas and ribs that day. They were also better than my old recipes. Who says you can't teach an old dog new tricks! So glad I found you. Girl where are the smoked neck bones. In the Lowcountry we use smoked neck bones or for a slightly healthier version smoked turkey neck bones. Just boil the bones in water for a time, then add the cleaned and cut up collards ( I cheat and use the bagged ones) and cook for a spell. Maybe some salt and pepper to taste. You'll be surprised how good they are. Try it. Love your site, recipes, and commentary. Awesome! We don't eat bacon (if you can believe that and bless our hearts), so this is perfect for us!! Thanks! If cooking before the first frost, add a sprinkle of sugar to cut the bitterness. I don't throw away the rib....I just cut down to the tuff part, I cook rib & all....will try ur way never heard of it gonna give it a try. Me too, even all with kale and atvthe verybendbo throw in some spinach. U use green onions. Just cooked a pot of greens last night for New Years Day, sometimes I'll use smoked neck bones, last night I used salt pork. We're doing the whole deal for New Years Day, roasted pork shoulder, collard greens (w/pepper vinegar of course), sweet potatoes, black-eye peas, deviled eggs, cornbread and sweet tea, and last but not least a caramel cake for dessert. Oh yeah... My mom grew up in North Carolina and they say the same thing about the frost and the collards, although now, she'll buy them before a frost and freeze them a few days before cooking them. She says it makes them "more tender". And let me tell you, if you cook your greens with the ribs in them? well that would be a time where you'd just eat them and under your breath say "bless her heart, she doesn't know how to cook greens..."
I agree if you cook your greens with the ribs then you sure aren't a true Southerner!!! This is why I'm so shocked when I order them at a famous Southern cook's restaurant and they are full of ribs!! I love greens!!! Ummm I'm from Mississipi and thats not true. I pull off the steams but some people don't. Thats moreso a preference and a bit over dramatic to say that this makes someone "non southern" or they can't cook greens. I'm thinking I need an invite to YOUR house this New Year's YUMMMM! My dad grew up in North Carolina and my mom in South Carolina. I feel like you're calling me home. I'll get there early so I can sample everything and by sample I mean devour. Just so you know. Will these still be okay if I omit the onion? My husband doesn't like onion and refuses to eat anything with onion in it. What is he like 12 yo??? I used 10 ozs of greens 5 strips of turkey bacon, half an onion, and a cup and a half of water, which I slowly added over the course of an hour. Salt, too. Yummy! This recipe looks excellent but I don't really know what "collard" greens are. They look like a type of cabbage. Am I right? If so, what type? Could I use what we refer to as "spring" greens? Or should they be the leaves of "sweetheart " cabbage? Hoping you won't mind replying. Thank you. Nope. 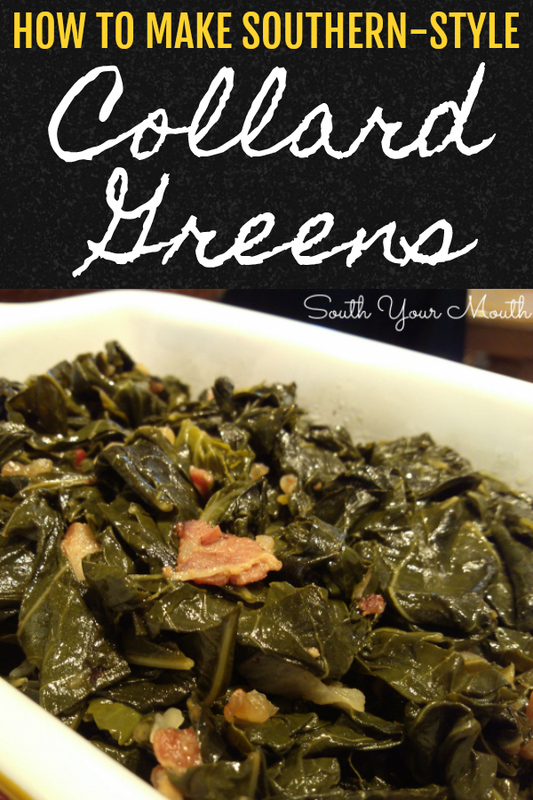 Collards are a type of greens that are grown durring cold weather. They are dark green, large leaved in a bunch. Also similar to mustard and turnip greens. Just look for them in the produce section especially during fall/winter. I've always boiled mine with smoked turkey, I can't wait to try this way! My husband doesn't like greens, especially the smell, so I cook them outside in a pressure cooker on the eye of my gas grill! Like you, I start with bacon (applewood smoked, thick cut), but I add a splash of apple cider vinegar, a can of chicken broth, a can of petite diced tomatoes, a few cloves of garlic, some red pepper flakes, salt and pepper. They take about 15 minutes after the pressure is rocking. YUMMY! And the pot liquor is drinkably good! Thank you for talking about taking out the center stem. I hate when collards or turnips are served with that stem! Happy Thanksgiving! That sounds absolutely divine! Thank you for sharing and happy Thanksgiving to you too! Hey there South Your Mouth! So I have a pot of your Tuscan Chicken Stew going on a dreary Sunday and the smell is making my stomach roaaaarrrr!! Now I'm looking at your recipe for collard greens since collards are my FAVORITE green AND vegetable. I was raised by South AND North Carolinians and I gotta say...never heard of greens done in a skillet. I've always done them boiling in a pot of water with vinegar, ham hock or neck bone, boil 'em down til they're dark and of course salt and pepper. LOVE 'em that way lemme just say. However...your way sounds like I need to try 'em that way...especially with the deliciousness of bacon and bacon fat....which I grew up on. Do not judge me folks. I didn't say anything about the lard! Moving on...I LOVE your site! I LOVE the way you write! It's like we're sitting down chatting with each other (which we are in my mind). Your recipes call out to me...Jaaaackie....look what I have for youuuuuu. Ahem....OK. Off to check my stew South. Have a glorious Sunday. I'm about to. Time to make the cornbread. Later gater. It is true, greens are much sweeter after the cold. I have put mine in the freezer for a bit before cooking, almost has the same effect as a frost. These Collards look wonderful! Just like how my Granny always made them! Hey Mandy and all readers. Have you made greens in the instant pot? I know it's not slow food but I have limited energy and time for tomorrow. I'm going to give it a go and let you know but interested in your opinion or tips.